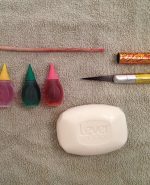 Many youngsters start off carving soap because it’s soft enough to carve with plastic or wooden tools. 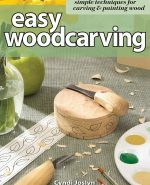 But, you can use sharp metal tools to create even more intricate designs without having to deal with hard spots or difficult grain. Add color using simple food coloring. 1. Prepare to carve. Assemble the tools and materials you will need. Select a soft, white bar of soap, such as Lever 2000. 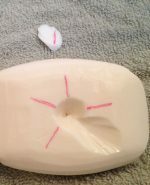 The soap should be easy to carve and not crumbly. Gently scrape off the logo to make a smooth canvas for carving. 2. Rough out the flower. 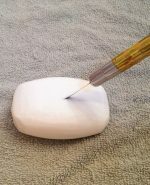 Insert a knife about 1/2″ (13mm) into the soap at the angle shown. Rotate the knife in a circle and remove the cone-shaped section. 3. Carve the petals. Draw five lines radiating out from the hole like a star. Each line will be the middle of a petal. Use the knife to carve a shallow oval petal shape around each pen line, removing the lines. 4. Outline the petals. 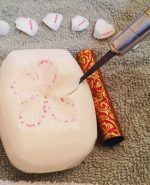 Draw a petal shape in each carved oval. Hold the knife at an angle and cut on the lines to outline each petal. 5. Undercut the petals. 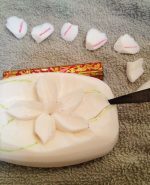 After shaping the tops of the petals, use the knife to remove material from under each one so they stand out from the background soap. 6. Carve the leaves. Draw several leaf shapes, and repeat the process to carve them with the knife. Use the knife to carve vein lines on the leaves. 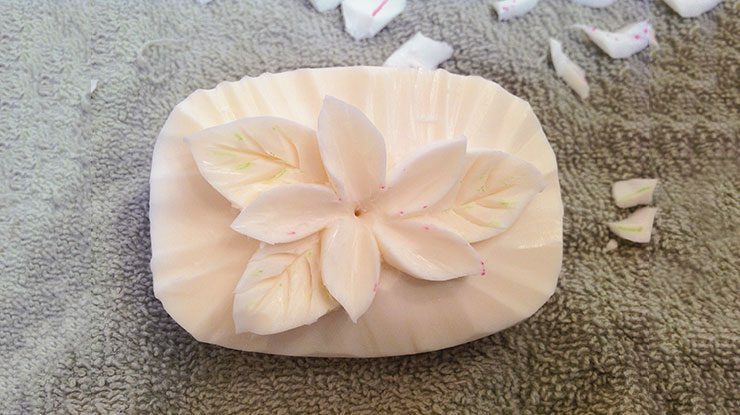 Carve the background soap down farther so the petals and leaves stand out. 7. Paint the soap. I use food coloring. 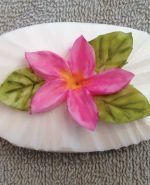 Use yellow on the middle of the flower, pink on the petals, and green on the leaves. The colors will fade over time so it is best to make the colors fairly vivid. 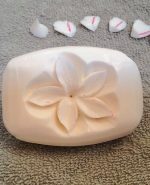 Download the Soap Flower pattern HERE! Sue Wagner carves both soap and vegetables in San Diego, Calif. Visit her online at soapsculpture.com. Available for $14.95 plus S&H from www.FoxChapelPublishing.com.